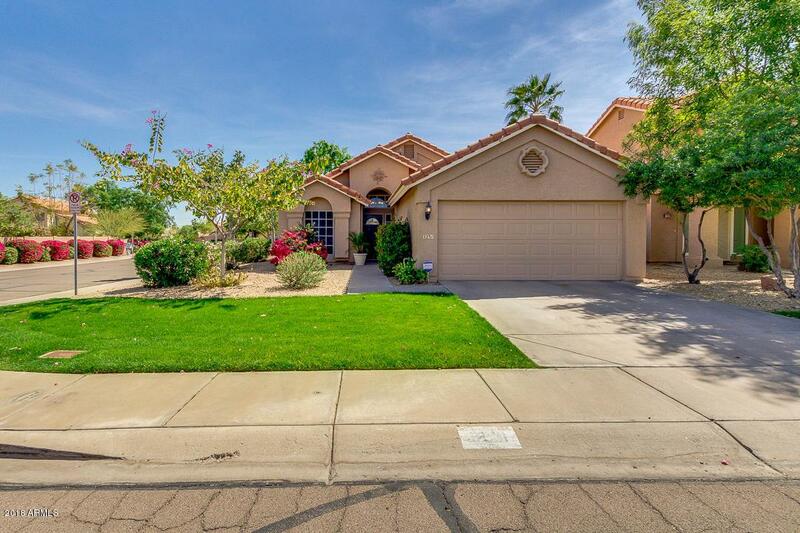 Rare Community Pool home on a N/S facing corner lot in the highly sought after community of Lakewood in Ahwatukee! Of 25 subdivisions in Lakewood, this is the only one that has a community pool! Gorgeous move-in-ready home featuring grassy landscape with mature plants, 2-car garage, & beautiful curb appeal. Fabulous interior boasts vaulted ceilings, formal dining, family room with cozy fireplace, diagonally-laid tile throughout, carpeting in bedrooms, neutral color palette, & so much more! Lovely modern kitchen is equipped with stainless appliances, upgraded cabinetry with custom pull-outs, high-end faucet, pantry, & breakfast room. Spacious master includes private remodeled bath with custom tiled shower & flooring, dual sinks, walk-in closet, & private toilet room with additional storage.Additional features include newer H2O heater, separate laundry room, 3-in blinds, ceiling fans, plant shelves, built-in garage cabinetry, & more! The beautiful backyard offers convenient storage shed, covered patio, shade trees, gravel landscape, several raised garden beds, & just the right amount of grass. Enjoy all of the amenities this neighborhood has to offer- the community pool is just behind the home. The lake, parks, & school are just a short walk away! This property has been very well maintained. HOA maintains front yard & community pool. Come quickly...This one won't last long! Call to schedule a showing before it's too late!